This plastic canvas North Pole village Reindeer Barn is the perfect abode for Rudolph and all his friends! Keep reading to learn how I made it. The next plastic canvas Christmas village building I made after I finished Santa’s house was to make a Reindeer Barn. I mean Santa can’t deliver the gifts without reindeer, right? 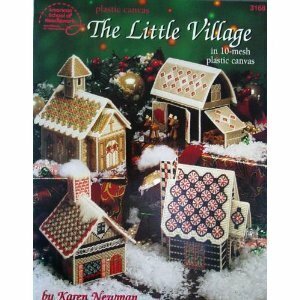 I used The Little Village plastic canvas pattern book to make the reindeer barn. The pattern calls for 10 count plastic canvas stitched with embroidery floss, but I thought that would make the finished barn too small in comparison to Claus Chalet, so I used 7 count instead. I left the main doors of the reindeer barn open and glued some natural colored Spanish moss to the floor for hay / bedding. One thing I really thought was cute about this particular plastic canvas village building pattern was the little lean to on the side of the barn. I thought it was such a cute idea to use cinnamon sticks as logs, so that was what I did as well. As an added bonus, it smells great too! I couldn’t find any reindeer figurines that I liked, so I made my own from polymer clay, modeling them after the reindeer that were on the cover of the plastic canvas pattern book. I used seed beads for the bells on the reindeer harnesses and for their eyes. I am not very artistic, but I thought they turned out pretty cute. I finished off the scene with some cotton batting “snow” and a bare branch tree I picked up years ago at a craft store. I always thought the little cardinal at the top was the cutest thing and I love the detail for the tree bark! I hope you enjoyed seeing the Reindeer Barn I made for my plastic canvas Christmas village. Be sure to check back to see more of my plastic canvas North Pole village displays in the days leading up to Christmas. Happy Crafting!